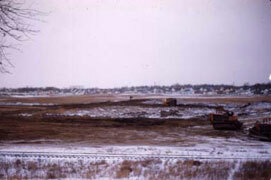 An interesting thing to know about Aquila Elementary School is that it existed before it had a building! During the 1956-’57 school year, overcrowding at the grade schools led to 366 elementary school students occupying the south wing of the third floor of the High School. They would be reassigned to Aquila in the Fall. During the 1956-’57 school year, that part of the High School would be known as Aquila School, with Bob Dougherty as Principal. 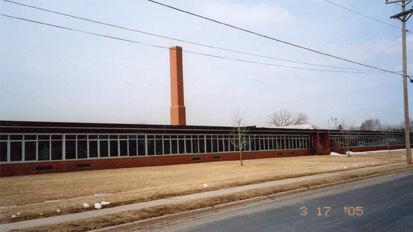 Aquila Elementary School was built at 8500 W. 31st Street in 1957 with 27 classrooms. Architects were Bissell and Blair. 900 students attended in the first year. It was designed to fit its terrain, and had only one step at the front entrance. Its location precluded a basement or second story, so it was ideal of handicapped students. An addition was built in 1967. The name Aquila came from Mrs. Richard J. Westling, whose husband had developed the entire neighborhood. The Westlings had the choice of street names, but they had to fit the guidelines of the City. For that alphabet, streets had to be named after battles. Mrs. Westling originally wanted to name it Aragon, but it was deemed too close to Oregon. Then she found a book called Action at Aquila, which described a Civil War battle where 8 men were killed. The 1938 novel was written by Hervey Allen (who also wrote Anthony Adverse in 1933, which Warner Bros. made into a major motion picture in 1936, starring Fredric March, Olivia de Havilland, Claude Rains, and Gale Sondergard, and directed by Mervyn LeRoy). Also see Aquila School’s web page. The SLP Historical Society has Aquila yearbooks from 1985 to 2010. A 1995 community handbook identifies Aquila’s mascot as the Eagle.